Outside the town library in Durlesti, Moldova, children surround the peace pole that was planted in recognition of the commitment made by this City of Peace. Welcome to Trish Ostroski and the citizens of Durlesti, Moldova: City of Peace. Like its country, Durlesti seeks a means to build peace and improve its community and the future by building relations and establishing models for peace. The Durlesti coat of arms and the initiative’s newly developed logo–Durlesti for Peace” in Romanian. • To foster and develop a peaceful, progressive and prosperous society in Durlesti with a strong world vision. • Durlesti to be a city of peace, prosperity, growth, sustainability, acceptance and understanding. • Durlesti to be a city known for its innovation, opportunity, education, culture, business and community pride. Durlesti annually celebrates the International Day of Peace September 21. Youth are involved in all aspects of the day. • Nurture a culture of peace in the human mind and the human spirit. 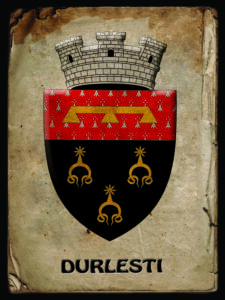 • Create a strong and powerful identity for the City of Durlesti and its residents. Build a future of hope, self-determination, respect and responsibility. • Foster a community that connects with and knows and respects its neighbor of all ages, backgrounds, abilities. 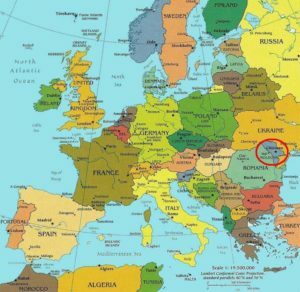 • To make Durlesti, Moldova the first designated city of peace in the country of Moldova. 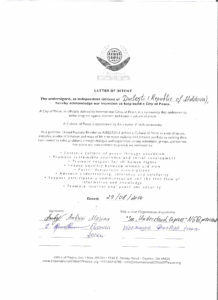 • To make Durlesti the first designated city of peace from the countries and area formerly known as the Soviet Union thus writing a new history going forward. • To be a community that leads in peace and peace making. Marina Ambrosi president of NGO “See, Understandd, Express” dresses in a traditional Moldovan blouse. 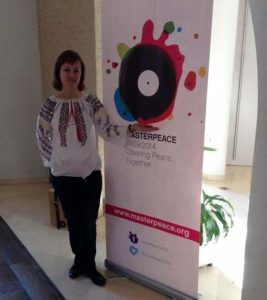 Durlesti has a chapter of MasterPeace an international organization that focuses on peace and the arts. • To establish a peace park or area of reflection in either an existing park or a new designated area. • To develop a youth peace camp with a focus on peace building skills as well as other important leadership and communication skills. • To improve communication among Durlesti residents via a more active presence on the internet and social media and other means of communication including interpersonal. • To continue the honoring of the International Day of Peace on September 21 on an annual basis. • To connect residents across neighborhoods and generations to preserve the stories and history of Durlesti and its past and write a strong legacy for future generations. • To establish a peace museum. • To unify causes, programs, people and organizations for the greater good of civil society. • To have a peace program or special project of community improvement that is locally funded to be completed on an annual basis. As the closest city to the capital city of Chisinau, Durlesti has a mission to establish itself with a strong identity versus being just considered an extension of Chisinau. In addition, the city of Durlesti would like to distinguish itself and strengthen its identity as a city dedicated to peace. It strives to engage its young people to build on that premise for the future. Most recently the city has activated a youth council for input from students and to develop leadership among its youth. Durlesti honors International Women’s Day March 8, Children’s Day June 1 and has an annual Hram in November which celebrates the city and its heritage with music, dance, speeches, contests and more. The Sunday after Easter is Memorial Sunday. Thousands make their way to the local cemetery to honor deceased family members as a community. In 2013, Durlesti established its first International Day of Peace on September 21. In 2014, Durlesti held its first “Peace and Pieces” which is an oral reading project with a variety of stories, poems and essays recited in varied languages, thus closing the language barriers by offering greater inclusion. NGO See, Understand, Express was established in 2011 in Durlesti. The organization partnered with worldwide organization MasterPeace to build peace projects and relations. Durlesti was the first and currently the only MasterPeace city partner in Moldova. 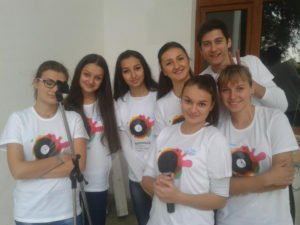 From November 2013 to November 2014, Durlesti has been established as the city in Moldova to lead the way in a youth and music cultural exchange with Romania and the Ukraine. This program seeks to exchange musicians and music of classical, popular and cultural among these three bordering countries. The Association of Supporting Children with Special Needs – ASCSN is another NGO with a facility in Durlesti. This agency has a passion and a goal to increase inclusion of youth with disabilities in the community. Paying respect to its history and heritage, numerous memorials dot the streets and parks of Durlesti. These areas honor those families that were sent to Siberia under the Soviet reign, and those individuals who served in the military such as in military action in World War II. It is with a spirit of peace that the city moves forward from the trying times of its past history to a new identity of a city of peace as a new generation moves away from the Soviet influence and marks a renewed spirit. Durlesti strives for a spirit of peace. A renaissance has started to take over the city as new buildings are built, a new school has recently been renovated, and the cultural center has added modern recording studios as a link from Moldova to Romania and Ukraine. The residents mark their lives through the arts as an expression of peace. The Peace Corps has been in Moldova since 1993. Durlesti had never had a Peace Corps volunteer and took action to request a volunteer and received one for the first time in 2013. This connection with the Peace Corps has assisted Durlesti to be in touch with possible opportunities for its youth. In the last year, youth have participated in business and leadership programs and projects which seek to bring insight into the problem of human trafficking in Moldova, so it can be reduced and eliminated. Future projects on Durlesti’s journey include hopes for a peace park, youth camp with a focus on peace and efforts for unifying the community through programs, activities and communication. Trish Ostroski has been a Peace Corps volunteer in Moldova since arriving in June of 2013. After a training period she moved to Durlesti, Moldova to become that city’s first Peace Corps volunteer. Her term of service is to the summer of 2015. Trish grew up in Akron, Ohio and is a graduate of the University of Akron. As an adult, she moved to Los Angeles, California. While in Los Angeles she had a career in advertising, followed by a career as a hypnotherapist. In addition, she was active in the theatre world as well serving as a theatrical reviewer for the Tolucan Times, being a playwright, author, stage director and more. She was the creator and producer of the Red Carpet Awards for Women in Theatre an organization that she also served as president. 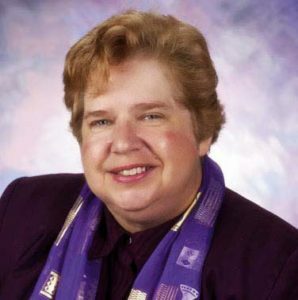 She was active in a variety of community and leadership activities. She was fortunate to be honored with a number of awards for service, writing, speaking, video production and more including the Red Carpet Award and the Mahar Award extended by her high school alma mater St. Vincent-St. Mary in Akron. While in Los Angeles, Trish continued her studies at UCLA and also pursued master degree studies at Gonzaga University in Spokane, Washington. Inspired by the possibilities of joining the Peace Corps since President Kennedy’s establishment of the agency, she finally decided in 2012 that the time was right to start the application process and exactly one year later joined fellow volunteers in Philadelphia, Pennsylvania for a day of orientation followed by a flight to Moldova the next day. While in Moldova, her primary assignment is with NGO See, Understand, Express. The organization encourages the use of English from an early age and in addition fosters youth, community programs, and opportunity in the arts. Durlesti borders Chisinau which is Moldova’s capital. Durlesti was established in 1470 and was built on the site of two ancient villages. The city currently has a population of 17,600. It is the 17th most populated city in Moldova and is the largest of the Chisinau suburbs. City area is about 3000 acres with about 9000 individual houses and more than 1000 farms. Durlesti is both rural and urban and has some major employers including a chemical plant, medical facility, and printing house. Small businesses including small shops for groceries, auto repair, and beauty services add to the slow, but steady economic develop. Moldova is a country rich in history as its existence can be traced to the first century. 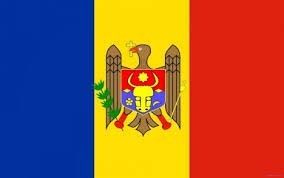 Moldova is in Eastern Europe and is bordered by Romania and Ukraine and has a population of about four million. Its capital city is Chisinau. In the modern era, Moldova has established itself as a country that seeks peace and prosperity. 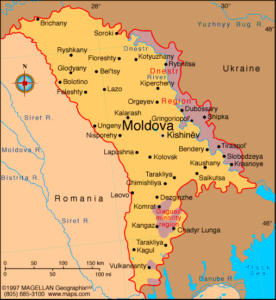 Moldova was formerly a part of the Soviet Union. The country declared itself an independent state in 1991 as part of the dissolution of the Soviet Union. A new constitution was adopted in1994. In 1990, the Parliament adopted the Declaration of Sovereignty of the “Soviet Socialist Republic Moldova”, which, among other things, stipulated the supremacy of Moldovan laws over those of the Soviet Union. In that same year, Moldova, along with most of the other Soviet republics, signed the constitutive act that formed the post-Soviet Commonwealth of Independent States (CIS). In 1992, the country gained formal recognition as an independent state at the United Nations. In 1994, Moldova became a member of NATO’s Partnership for Peace program, and a member of the Council of Europe on in 1995. Moldova is a member state of the United Nations, the Council of Europe, the World Trade Organization (WTO), the Organization for Security and Cooperation in Europe (OSCE), the GUAM Organization for Democracy and Economic Development, the Commonwealth of Independent States (CIS) and the Organization of the Black Sea Economic Cooperation (BSEC). The country aspires to join the European Union and, to this end, has implemented an action plan within the framework of the European Neighborhood Policy. Moldova is committed to a number of international and regional control of arms regulations such as the UN Firearms Protocol, Stability Pact Regional Implementation Plan, the UN Programme of Action (PoA) and the OSCE Documents on Stockpiles of Conventional Ammunition. Since declaring independence in 1991, Moldova has participated in several UN peacekeeping missions. Moldova signed with Romania a military agreement to strengthen regional security. The agreement is part of Moldova’s strategy for military reform and cooperation with neighboring countries. After achieving independence from the Soviet Union, Moldova’s foreign policy was designed with a view to establishing relations with other European countries, neutrality, and European Union integration. In 1995 the country was admitted to the Council of Europe. In addition to its participation in NATO’s Partnership for Peace program, Moldova is also a member state of the United Nations, the Organization for Security and Co-operation in Europe (OSCE), the North Atlantic Cooperation Council, the World Trade Organization, the International Monetary Fund, the World Bank, the Francophone and the European Bank for Reconstruction and Development.